Hair transplantation techniques have come a long way in the last two decades. Modern transplant surgery minimizes scarring and yields such natural-looking results that they can even fool your barber. Unfortunately, outdated methods left some transplant patients with a distinctive “plug” look and other aesthetic issues, but True & Dorin offers solutions to help these patients achieve natural-looking restoration. Using the latest techniques, we perform hair transplant repair to help New York, Boston and New Jersey patients achieve a softer, more natural-looking head of hair. If you are unhappy with the results of a prior hair transplant, contact True & Dorin to schedule a consultation. What is a ‘Bad’ Hair Transplant? The doctors at True & Dorin use the latest, most advanced technologies for effective hair transplantation. In Follicular Unit Transplantation (FUT), narrow strips of hair are harvested from the back of the head, then follicular unit groupings of one to four hairs are extracted to use for transplantation. These hairs are carefully placed into tiny incisions in the balding area, where they will add growth and density. Follicular Unit Extraction (FUE) is a similar procedure, but less invasive. Individual follicular units are isolated and removed with tiny, superficial punches to the skin, so no incisions or sutures are needed. FUT and FUE technology can be used to significantly improve an unsatisfactory hair transplant result. By transplanting follicular grafts at the hairline, we can eliminate the “plug” look, and reconstruct the hairline to create a softer, more natural look. New transplants placed to surround the large grafts can camouflage and soften their appearance. In some cases, the best results are obtained by removing abnormal grafts and using follicular unit technology to redistribute and re-implant the hair. Scar tissue is removed along with the grafts, improving the overall appearance of the scalp. FUE is also an effective method for camouflaging a large or linear donor scar. Hair is extracted from the area near the scar, and implanted to cover the scar. Another option for camouflaging a widened donor scar is scalp micropigmentation (SMP). SMP is a permanent cosmetic tattoo that mimics the look of short hairs on a closely shaved scalp. It can be used to conceal scarring, and in some cases, is also used to camouflage a patient’s thinning hair. 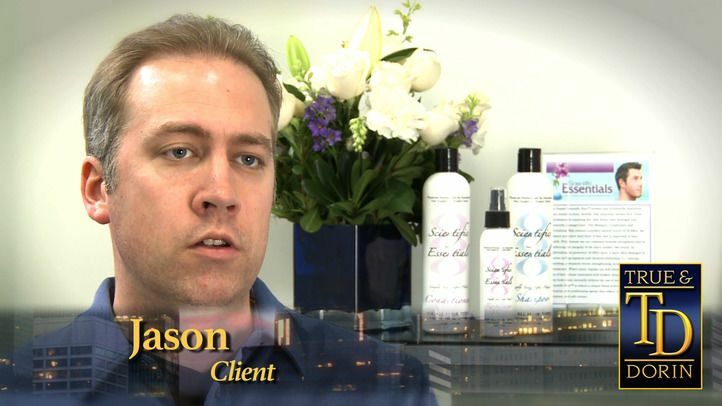 In this hair surgery patient testimonial, Jason discusses his experience at True & Dorin. His graft was an all-day procedure that was painless, resulting in a full head of hair. A personal consultation with Drs. True and Dr. Dorin is the best way to determine which hair transplant correction techniques are best for you. To make an appointment, contact our office today. FUT v. FUE: Which is Right for You?